Fred was in the side for almost the entire season 1913-14. He scored the goals in the Qualifying Cup semi final replay that took Hibs to the final of that competition for the first and only time. Although he re-signed for season 1914-15, he volunteered for military service immediately following the outbreak of WW1. 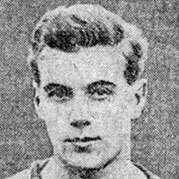 Fred remained a registered Hibs player all through the war years until he was released in May 1919 but returned very briefly towards the end of season 1921-22. Fred was born on this date in Wandsworth, London.